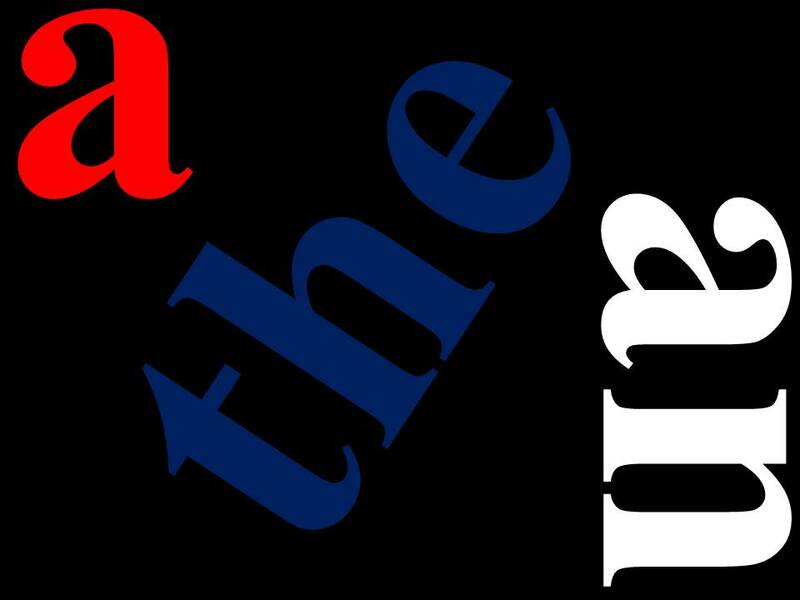 In a previous post of WORDS ON THE LINE, I explained why the definite article (the) and the indefinite article (a, an) are so difficult for people learning English, especially those who do not have articles in their mother tongue. To help those people, I will write an occasional post on some tricky uses as they pop up in my students' writing, beginning with this post. Our inspector had concern about the quality of a work by contractor. Since concern is a noun and not an adjective, the indefinite article is necessary. Write either Our inspector had a concern (concern is a noun) or Our inspector was concerned (concerned is an adjective, so the article is unnecessary). Quality of work is a term of art (meaning it's just the way businesspeople use it, so a is unnecessary. When we use the noun work in a general sense (e.g., work is important), the article is also unnecessary. However, the work could be specific in the mind of the writer and reader, so quality of the work would also sound right. But quality of a work does not sound natural. By contractor needs an article for the same reason that concern does. If only one contractor is in question for the writer and reader, then the contractor would sound fine; if one contractor is being singled out among many and is not known to the reader, the writer should begin with a contractor and shift to the contractor when identified. More tricky instances of the definite and indefinite article will appear occasionally, so be on the lookout. First define progress. If technology figures into your definition, then you might very well be describing what Maggie Jackson refers to as the new Dark Age that has disconnected people from each other. Then describe intelligence. If you mention the ability to multitask, then you might already be too entrenched in the Dark Age to notice you're in it. 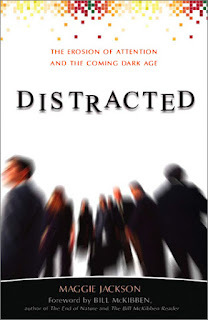 Distracted: The Erosion of Attention and the Coming Dark Age lists a litany of evidence to argue persuasively that beginning with the invention of the telegraph and continuing through smartphones and robotics, we are becoming increasingly mobile, less involved with our immediate environment, and more isolated from human contact. We spend less time with each other than we do with our gadgets, including TVs. This diminished participation in face-to-face contact contradicts our inclination as social animals to be part of a community. As MIT professor Sherry Turkle puts it, the gold standard of human relations remains in-person contact. Since nearly all of us read, write, listen, and talk with a computer for many hours each day, we may not be so much straying from the norm of human communication as we are creating a new norm. This notion directly affects how we email, text, and skype each other in our daily business transactions. Inspired by cultural geographer Yi-Fu Tuan's aphorism, "place is security and space is freedom," Jackson cogently delivers on an agenda that surpasses mere reflection on the threat of technology. She considers what it means to be human in these times. Bill: How can I improve my writing? Phil: Then read a lot more. That's a start. Phil: What do you read now? 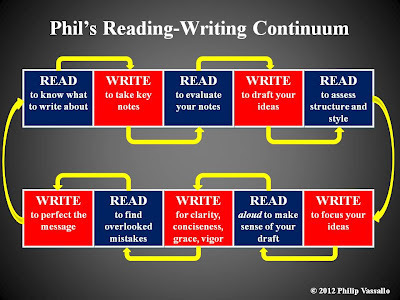 Phil: That will make you a subject-matter expert but not necessarily a good writer. Read outside your field to become a better writer. Jill: Unlike Bill, English is not my first language. How can I improve my writing? Phil: Do you read a lot in English? Jill: Mostly in my native language. Phil: Then you have to read twice as much as Bill. Read outside your field in your native language to keep fresh, and outside your field in English to pick up the elements of excellent English writing. Writing a lot is only half of becoming a good writer. You have to read a lot too, as eclectically as possible. I know I have made this point before in this blog, but it is so important, especially these days, when people scan and skip more words than they read. I showed a more simplified form of this illustration in an earlier post, and I have revised it not to complicate the reading-writing connection, but to clarify it for those who need to write more complex messages as they move up and across their organizations. It plainly shows how you can't do one without the other. The eighteenth-century French philosopher Jean-Jacques Rousseau began his famous book The Social Contract in 1762 with the sentence, “Man is born free, and everywhere he is in chains.” Oh, doesn’t that statement hold so true 250 years later! We are tethered to our smartphones and held captive by every social networking platform—all of us trying to find the next best thing that we can parlay into a new venture while drifting in an unstable economy and uncertain marketplace. A look at recent headlines shows that digital communication and social media are changing not only the way we do business but the way we think. The last American bookstore chain is fighting for its survival. Apple is assuring us that textbooks as we know them will soon be extinct. Even cursive writing is facing its demise. Newspapers, themselves, are facing the same fate. Fighting these trends in our own organization is like trying to empty the ocean with a beach pail. Worse, to ignore them is like sticking our head in the sand. Ours is the Age of Two Realities, with apologies to Charles Dickens. It is the best of times, it is the worst of times, it is the age of communication, it is the age of miscommunication; it is the epoch of access, it is the epoch of detachment, it is the season of knowledge, it is the season of ignorance, it is the spring of upstarts, it is the winter of bankruptcies, we have everything before us, we have nothing before us, we are going direct to success, we are all going the other way—you get the point. Like it or not, these are our times. Driven by an I-don’t-want-to-miss-the-party mindset, many people are signing up on more than a dozen social media sites to ensure their word gets out and their business keeps pace with these constant changes—all the while wondering whether they’re doing the right thing. The truth is, who really knows? Create specific objectives. That means put them in writing—in your marble notebook, iPad, or bathroom mirror, wherever. The goal might be to get your message across to new clients, or to stay in touch with associates, or to announce new business opportunities. Include a content marketing plan with content contributors, sources, and scheduling: what will you write or post, how often, and for whom? Set time restraints. This imperative is at the heart of any time management course you have ever taken or will take. As a small business struggling to be seen in the vast universe of information overload, I have established the rule of no more than one hour during nights following speaking engagements (which amount to 12-hour days) and three hours on off days. Set your own strict limits as they suit your business initiatives and stick to them, adjusting only after carefully reviewing your social media plan. Follow the rule of There-Are-No-Rules. 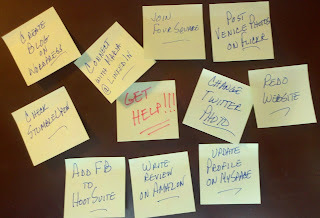 Think of social media marketing as going to school. We’re all still learning as we do our thing—even the e-gurus. If the “experts” checked out what they said a couple of years ago—no, a couple of months ago—you can bet they’d want to retract certain statements. Need I mention floppy disks, zip drives, CDs, VHS tapes, DVDs and other dead technologies to bring this point home? This reality means that we have to guard against fixed ways of decision making and overdoing the tendency to use routine communication models as the e-commerce terrain shifts interminably. Enjoy the journey, Here I’m borrowing from AMA President and CEO Edward T. Reilly’s parting words in his video pep talk that kicks off all of AMA’s classroom courses. Understand that website-builder and blogging tools are still loaded with kinks that have even expert IT engineers scratching their heads. Still, you will find a lot of fun out there as you research, hyperlink to other sites, and create your own art while developing content. You will make lasting valuable connections as time goes on and perhaps establish new ways of reaching out to your audience that experts haven’t thought of. Just ask Amanda Hocking, whose novels went viral and took her from obscurity to best-selling author. And then, just get started. Try out some things and see what works—and what doesn’t. At worst, you’ll discover it isn’t for you. At best, you will have found a new way to connect with people —which can’t be a bad thing, in these disconnected times. I have often recommended books on writing style, notably Artful Sentences, The Art of Styling Sentences, and Style: Ten Lessons in Clarity and Grace. Opinions on style are as numerous as there are readers of books, and such impressions have appeared in print for a long time. Remember George Orwell's 1946 essay "Politics and the English Language"? It's 66 years old, but English professors still refer students to it. While some of Quiller-Couch's ideas hold true today, writing has changed dramatically a century later in light of globalization, technology, and social networking. So stay tuned.